GUANGZHOU, China, Dec. 13, 2018 /PRNewswire/ — The 2019 International Signs and LED Exhibition (ISLE), one of the flagship events in the industry, will be held from March 3-6, 2019 in Area B of the Canton Fair Complex in Guangzhou, China, welcoming LED manufacturers, distributors, service vendors, and advertisement companies, as well as government departments and end users. The annual exhibition, which attracted 230,000 visitors in 2018, will gather together large professional purchasing groups from 18 countries including the US, Germany, Russia, Japan and South Korea, as well as more than 18,000 exhibitor companies from across the world and international professional buyers from over a hundred countries next year. Exhibitor companies will include both premium domestic enterprises and well-known overseas brands such as Absen, Aoto,Yeard, Lightking, Liantronics, Yes Tech, Epson, HP, Suda, One Laser, Keundo and Ace. 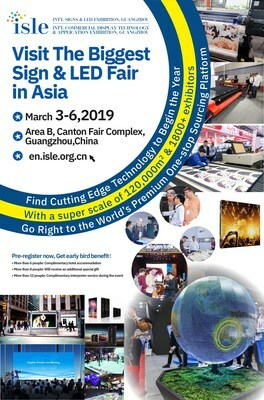 ISLE 2019 will have three exhibit areas featuring products from LED display screens and lighting to 3D displays, Mini LED, COB, smart media and smart advertising signs, as well as cutting-edge LED equipment. Sign & LED products are widely used for advertising, 4A, event planning, stage performances, audio-visual, security monitoring, education, business, department stores, hotels, conference systems, exhibition halls, stadiums, and more. The 2019 ISLE, organized by Canton Fair Advertising Co., Ltd and the China Foreign Trade Guangzhou Exhibition General Corp. (CFTE), is a fully integrated LED industry chain solution platform for professional, charismatic and intelligent advertising signs.